The Cutting Room is a one stop full operation company, designed to assist designers & brands through the complex procedures of creating a new collection. Experts at our company specialize in pattern making, sample making and production. With 30 + years of industry experience, we have the ability to connect designers with the knowledge and resources needed to succeed in the fashion industry. The Cutting Room has worked with a diverse variety of brands & designers, including many well established high end brands, and many designers that have shown at international trade shows, to up and coming labels. We have the ability to work with a variety of different fabrics. We would love to help you with sample making, pattern making, and production, CAD, grading, and marking making. We assist designers from ideation to developing a final product that is cost efficient and will satisfy the end consumer. This is where it all starts. The napkin, so to speak. Define and understand the opportunity, create concepts and patterns to pursue and satisfy the market, and develop prototypes to test. 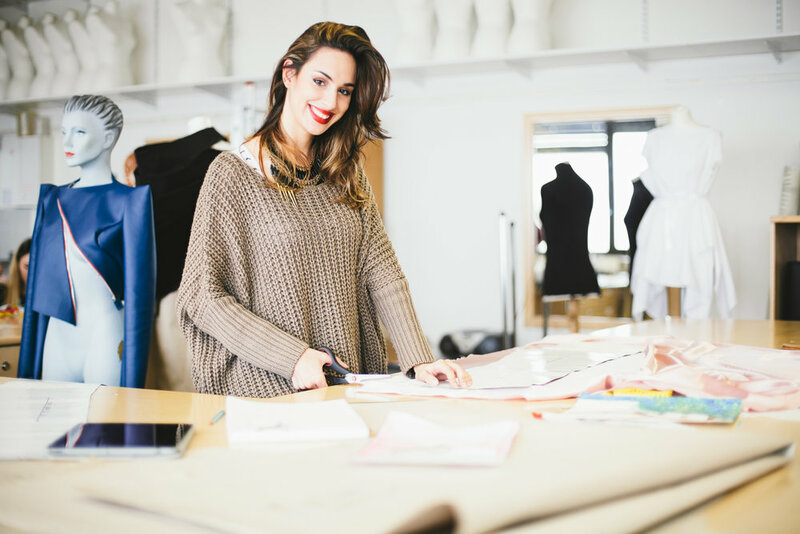 The Cutting Room is a leader in pattern making and sampling, helping you establish a winning idea to swiftly go-to-market. With 25 years navigating the global sourcing ecosystem, we know how to tame (and manage) the beast. Whether you’re looking for small or large runs, knits, wovens, or leather, we specialize in samples and small production 300 units per style or less. All product is made in-house. Nailing sizing, block patterns, and materials specifications is no easy task. This is where money is made, and often lost. Marker making is where the big gains in efficiency are, Let us show you how it’s done. Samples of initial designs & prototypes are a critical stage in the apparel process, and we can help with that, producing samples in-house. We deliver quality samples quickly, helping you validate and evolve the garment. Much like sampling, production of finished product, whether it’s capsule collections for established brands or first collections for new ventures, is an exciting time in the fashion cycle. Our team can get you to market efficiently and economically. We produce 1 to 300 pieces per style in- house and can manage larger production off-site for you. Fashion Illustrations are essential to any creative process. We can help you visualize your collection to your buyers and production team. At The Cutting Room, you will work with our Illustration team on creating professional fashion illustrations, cutting orders and technical drawings. With the option to work on a range of different styles and visual presentations our team will insure to make your creative vision a reality.